The Patent Wars have been going on for so long that you start to forget why we're here. Who shot first—Apple? Samsung? Greedo? Paul M. Barrett at Businessweek has a great rundown on how we got here, and why everything stems back to Apple's crusade against Android. Jobs's outrage reflected his formative corporate experience in the 1980s, when he refused to license the Macintosh operating system for Apple's stylish desktop computer. His nemesis, Bill Gates, licensed Microsoft's (MSFT) competing Windows operating system (and DOS before that) to numerous PC manufacturers. Jobs disdained Windows as an inferior product, but snob appeal notwithstanding, Microsoft stomped Apple in the desktop software marketplace. Jobs's notion of channeling his pique into a federal case faced several obstacles, however. As a practical matter, a judge could not order Google to stop selling copycat phones because Google didn't sell phones in the first place. Likewise, Google couldn't be forced to pay money damages related to allegedly contraband phones manufactured and marketed by other companies. 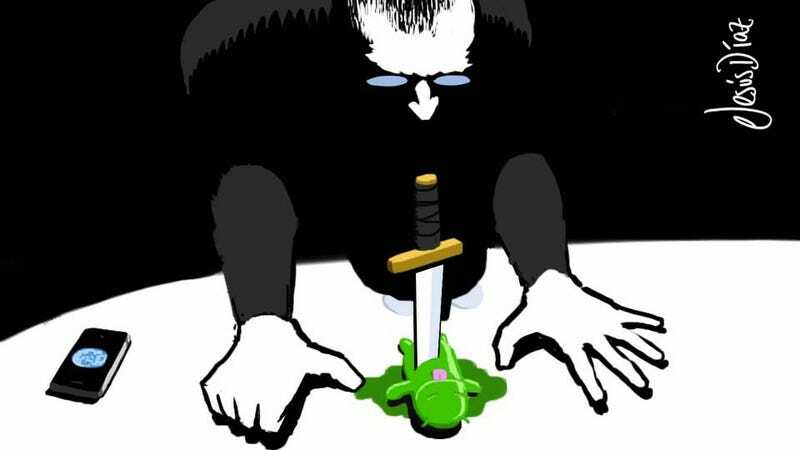 On a symbolic level, stabbing straight at Google's jugular might have provoked antipathy toward Apple among consumers and the Silicon Valley elite. For this dubious outcome, Apple paid a price: HTC and other phone makers began filing patent claims against Apple. Motorola Mobility didn't wait for Jobs to move first. In October 2010, the Libertyville (Ill.)-based manufacturer, represented by Quinn Emanuel, filed a trio of lawsuits and an ITC complaint accusing Apple of infringing its patents. Apple responded with an ITC action that Motorola phones running Android-the Droid, Droid 2, Droid X-copied the iPhone. For procedural reasons, Apple's claim moved more swiftly, and in January of this year, an ITC administrative law judge ruled that Apple had failed to show any violations by Motorola. On March 16, the commission upheld Motorola's victory. [Intellectual Property scholar] Shih suggests that a mobile-device patent war may have been inevitable. Gargantuan rivals with deep pockets converged on the market from several directions: Apple (and Microsoft) out of the computer business, Google from the Internet search-and-advertising business, Asian manufacturers from telecommunications. Suing over patents became just another weapon, like marketing or pricing.